I’ll admit I’ve been on team #SaveMurtagh since season two and as soon as the music changed in the prison cell and the bearded face of everyone’s favorite BFF appeared, I was grinning ear to ear! That’s right. Murtagh is back! Murtagh Fitzgibbons Fraser seems to have nearly as many lives as Jamie. He has survived more battles than anyone cares to count and despite abysmal conditions at Ardsmuir, he is still hanging on. It does seem, though, he could use a little bit of help. We learn that Murtagh has been struggling in the 9 years since Culloden, suffering frequently from La Grippe as well as festering wounds (from rat bites no less!). La Grippe is a name for influenza, meaning “to seize suddenly,” likely a reference to violent shaking chills accompanying the fevers of an influenza infection. The term Influenza comes from the Medieval Latin “influentia,” from the belief that epidemics of this illness were due unfavorable astrological influences. With influenza season now starting to revisit the northern hemisphere, we often hear the tips and tricks to try to avoid the flu. In addition to an annual influenza vaccine, we are advised to: avoid close contact, wash your hand frequently, avoid touching your eyes, nose, and mouth, get enough sleep, eat a healthy diet, avoid crowds. Hmm, that definitely doesn’t bode well for these men living in the squalid, tight quarters of Ardsmuir prison! And what do these men have to treat influenza? A diet of thin barley brose and the occasional rat? The odds are stacked against them. Jamie is on the right track with his requests for blankets and improved food rations. 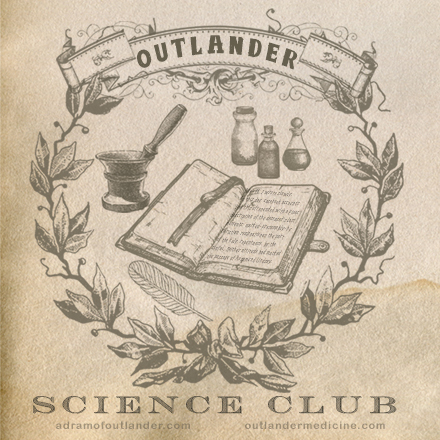 Did you miss the Outlander Science Club post and podcast all about La Grippe during the Voyager read along? Check it out here! What about those festering wounds? Jamie seems to think greens are the answer. He is right! Murtagh (and likely most of the men on the Ardsmuir diet) are suffering from scurvy. Scurvy is the result of a deficiency in vitamin C, which is required in the production of collagen in the body and plays a significant role in immune function. Without adequate intake of vitamin C, these men will begin to experience fatigue, malaise, inflammation and bleeding of the gums, bruising, joint pain, and poor wound healing. Thanks to his education from Claire, Jamie recognizes that Murtagh’s rat bite wounds are not healing and surmises this is due to a lack of greens in his diet. Watercress to the rescue! Always the keen negotiator, Jamie has convinced Major Grey to provide Murtagh with needed medical help. I’ll admit I was waiting to see that doctor come in and bleed Murtagh dry in typical 18th century fashion, but it turns out that with help from this doctor and vitamin C rich foods from Jamie, Murtagh is back on his way to health…just in time for a long voyage to the colonies. All may now find themselves suffering from phantom pains. Phantom Limb Pain: a phenomenon characterized by the experience of pain, discomfort, or other sensation in the area of a missing limb or other body part. In fact, one does not have to lose a limb to suffer from Phantom Limb Pain. It also can occur with the loss of other body parts: eyes, tongue, nose, even breast. The concept of phantom limb pain is not new. First described by the 16th Century French Military Surgeon Ambrose Pare, the term was first coined during the American Civil War by surgeon Silas Weir Mitchell. Up to 80% of patients who undergo amputation experience phantom limb pain with a range of symptoms including burning, shooting pain, “pins and needles,” twisting, crushing, electric shock feelings, itching, and vibration. In brief? The medical community don’t know exactly. There are a number of working theories. One mechanism thought to be responsible for these symptoms is due to the direct trauma of the nerves themselves during amputation. The severed nerves grow and form groups of nerve cells called neuromas which then generate impulses that travel back to the central nervous system and are interpreted as pain. Another theory suggests that the part of the brain cortex that normally receives input from that body area finds itself no longer receiving input. The cortex reorganizes and neighboring areas take over that part of the cortex. Because of this, pain impulses from areas of the body near the amputated limb are now interpreted as pain in the missing limb itself. Or perhaps the symptoms are due to the lack of input. Deprivation of the normal perception of that limb causes abnormal signals to be transmitted which are interpreted as pain. Whatever the exact mechanism (and there are likely more than one coming into play), unfortunately phantom limb pain remains a problem difficult to treat. When possible, controlling pain prior to amputation can help. Phantom limb pain occurs more frequently in those who had significant pain in that area prior to amputation. Medications including acetaminophen, NSAIDs, opioid medications (these are thought to diminish the cortical reorganization which is one of the potential mechanisms PLP develops), antidepressants, and anticonvulsants. TENS (Transcutaneous Electrical Nerve Stimulation) has been found to be helpful for some. Mirror Therapy is an interesting adjunct in treatment. Some theorize that the symptoms of Phantom Limb Pain are in part due to the absence of visual feedback about the limb to the brain. When a patient watches the reflection of their intact limb moving, the brain interprets it as the phantom limb moving, resolving the mismatch between the visual and sensory inputs about the limb. Fortunately, the prevalence of phantom limb pain tends to decrease over time following the amputation. The pain of love lost. So similar. Jamie and Claire both feeling less than whole, the pain still raw, and a constant reminder of what they have lost. A sweet moment for a new family. Claire and Frank are finally connecting, joyful over the birth of Brianna. The nurse has no malicious intent. Instead, she likely understands the Mendelian inheritance of red hair. A child born with red hair carries two copies of the recessive gene for red hair – one from the mother and one from the father. She of course then assumes that Claire or Frank likely has a redheaded family member they can recall in their line. Of course, there is much more to the inheritance of hair color, including details of blonde, various browns, and black hair, but for today, lets focus on red. We now know that the specific gene responsible for red hair is called melanocortin 1 receptor (or MC1R). Red hair is a recessive trait. Recalling back to genetics class, this means that for a person to be born with red hair, they must inherit a red hair gene from their mother and one from their father. If only one red hair gene is inherited, the child will have brown hair and simply be a carrier of the red hair gene. Could Frank and Claire have a biological child with red hair? YES! Indeed, Frank and Claire could have a redheaded biological child, though it would have been much more likely for Jamie and Claire. Assuming that Claire carries the gene for red hair (and we know she does since we’ve seen Brianna! ), each child of Jamie and Claire will have a 50% chance of having red hair. Frank and Claire had better get used to answering the question of the red hair. No doubt this is only the first of hundreds of times they will be asked. Only 1-2% of the human population has red hair. About 13% of the population of Scotland has red hair, the highest concentration in the world. Redheads are more sensitive to pain! They require significantly more anesthetic to block pain. This is thought to be due to the fact that the MC1R gene responsible for red hair also codes for a receptor that is related to a family of receptors involved in pain perception. Redheads have a higher risk of skin cancer, specifically melanoma. Redheads are more likely to be left handed than people with other hair colors! Redheads tend not to go grey. Their hair pigment lightens to blonde and white and avoids grey. People with red hair actually have fewer strands of hair than those with other colors. However, their red hair is thicker so it appears just as full. So glad to be back in the world of Outlander! Life has been pretty crazy and this is always a welcome diversion! What did you think of the Season Three premiere? I’ve been avoiding previews and teasers so I knew very little going in and loved it. So excited for what is to come!